This is also the time when we reach out to all our business partners, so that we do not lose touch with anyone. That is why we are planning a road trip with the meerkat mascot. The general idea is to visit schools and businesses in the Western Cape Province. 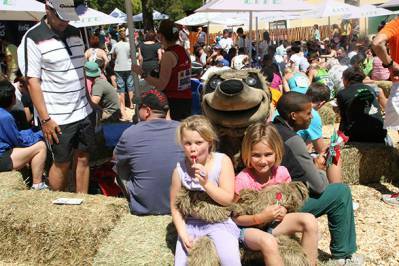 If, however, you are not familiar with the Karoo Meerkat mascot, please see the picture below. 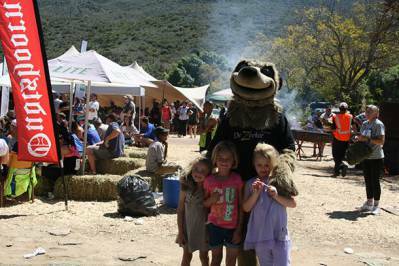 The mascot already has been overseas and is a regular site at the yearly Indaba in Durban. The mascot is interesting in the handing out of prices at marathon’s, visiting farmers market, handing out parcels at schools, or if anyone is in need, the mascot can lend a hand. If you are situated in the Western Cape, you are more than welcome to contact us. “The meerkat or suricate, Suricata suricatta, is a small mammal belonging to the mongoose family. Meerkats live in all parts of the Kalahari Desert in Botswana, in much of the Namib Desert in Namibia and southwestern Angola, and in South Africa. A group of meerkats is called a “mob”, “gang” or “clan”. A meerkat clan often contains about 20 meerkats, but some super-families have 50 or more members. In captivity, meerkats have an average life span of 12–14 years, and about half this in the wild. “Meerkat” is a loanword from Afrikaans. The name has a Dutch origin, but by misidentification. Dutch meerkat refers to the “guenon”, a monkey of the Cercopithecus genus. The word “meerkat” is Dutch for “lake cat”, but although the suricata is a feliform, it is not of the cat family, and neither suricatas nor guenons are attracted to lakes; the word possibly started as a Dutch adaptation of a derivative of Sanskrit markaţa = “monkey”, perhaps in Africa via an Indian sailor on board a Dutch East India Company ship. The traders of the Dutch East India Company were likely familiar with monkeys, but the Dutch settlers attached the name to the wrong animal at the Cape. The suricata is called stokstaartje = “little stick-tail” in Dutch. The meerkat is a small diurnal herpestid (mongoose) weighing on average about 731 grams (1.612 lb) for males and 720 grams (1.59 lb) for females. Its long slender body and limbs give it a body length of 25 to 35 centimetres (9.8 to 13.8 in) and an added tail length of 17 to 25 centimetres (6.7 to 9.8 in). Its tail is not bushy like all other mongoose species, but is rather long and thin and tapers to a black or reddish colored pointed tip. The meerkat uses its tail to balance when standing upright, as well as for signaling. Its face tapers, coming to a point at the nose, which is brown. The eyes always have black patches around them, and they have small black crescent-shaped ears that can close to exclude soil when digging. Like cats, meerkats have binocular vision, a large peripheral range, depth perception, and eyes on the front of their faces. At the end of each of a meerkat’s “fingers” is a non-retractable, strong, 2 centimetres (0.79 in) long, curved claw used for digging burrows and digging for prey. Claws are also used with muscular hindlegs to help climb trees. Meerkats have four toes on each foot and long slender limbs. The coat is usually fawn-colored peppered with gray, tan, or brown with a silver tint. They have short parallel stripes across their backs, extending from the base of the tail to the shoulders. The patterns of stripes are unique to each meerkat. The underside of the meerkat has no markings, but the belly has a patch which is only sparsely covered with hair and shows the black skin underneath. The meerkat uses this area to absorb heat while standing on its rear legs, usually early in the morning after cold desert nights. Meerkats are primarily insectivores, but also eat other animals (lizards, snakes, scorpions, spiders, plants, eggs, small mammals, millipedes, centipedes and, more rarely, small birds) and fungi (the desert truffle Kalaharituber pfeilii). Meerkats are immune to certain types of venom, including the very strong venom of the scorpions of the Kalahari Desert, unlike humans. They have no excess body fat stores, so foraging for food is a daily need. When visiting De Zeekoe Oudtshoorn Guest House, the meerkat adventure tour is one activity not to be missed.